I moved a lot of wiring connections from the battery compartment to the compartment above. 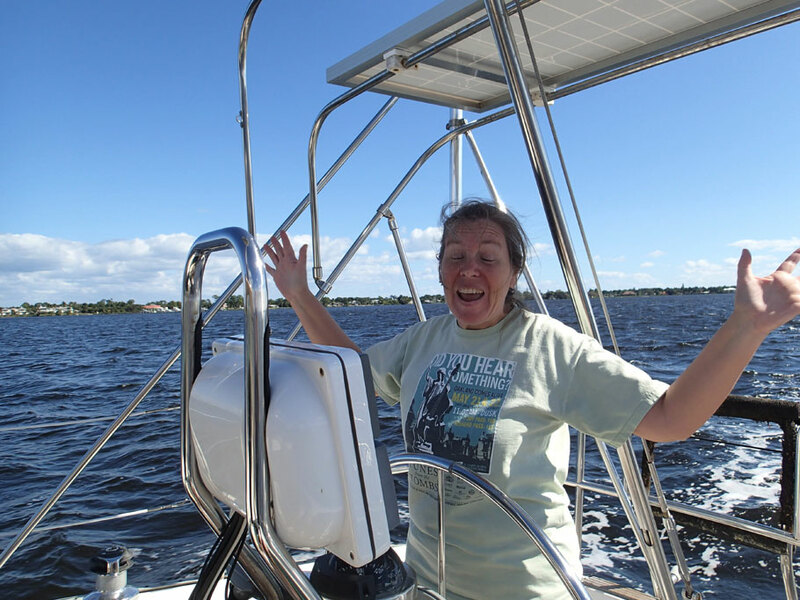 While we stayed in Stuart at my folks’ house, our boat lived ten miles up US-1 at the Sunset Bay Marina. Blue Wing was hanging from a mooring ball. Most days I would row out to Blue Wing, who was hanging on her mooring ball, to work on projects. I did a LOT of cleaning. I went over most of the inside with white vinegar, which helps keep mildew away. And in the lower compartments I cleaned the fiberglass with acetone. I cleaned the engine with brake cleaner. I removed the heat exchanger and cleaned, primed and painted it. I worked a lot on wiring also. I moved wires up out of the lower compartments. Then I fiber-glassed the wiring holes between compartments so each storage area would be watertight. I also chased down some wiring problems. Our portside cabin lights had all quit working. And so had our forward running lights. The wires for all these were strung down the port side where the hull and deck join. They were tucked up into a slot and screwed down tightly. Many junctions were just taped together instead of joined with waterproof marine connectors. I’m pretty sure the Catalina worker who ran the wires got an employee of the month award for saving wire. (He probably saved pennies per boat.) His efforts made it harder for me to trace wires and do testing, though. (At one point Duwan shoved our phone up into an inaccessible spot and took a pic. 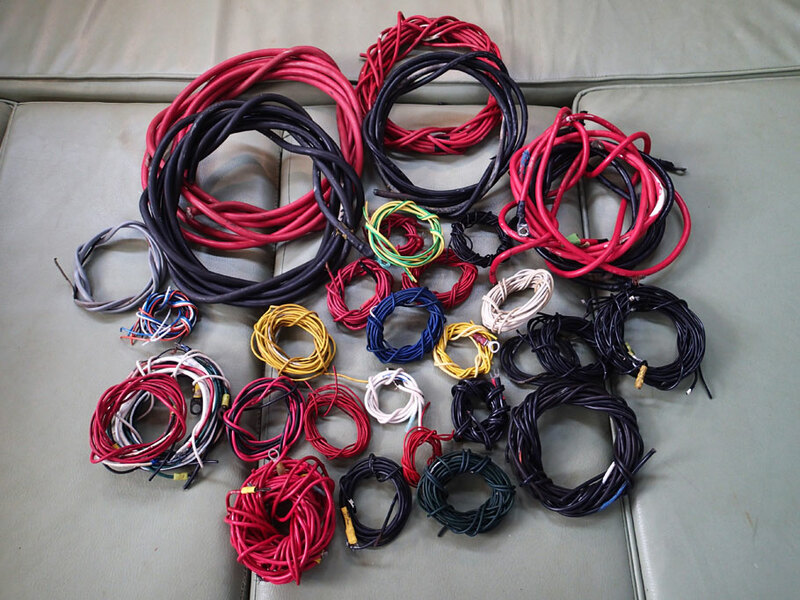 That’s the only way we could identify wire colors.) I ended up replacing a few sections, using marine connections, and leaving loops of slack wire to make any future efforts easier. I did a lot of wiring work. Here are some of the unused wires I removed. Some were already re-used and the co-ax and phone lines were thrown out. We dramatically improved our cabin lighting by adding a few of these swivel lamps and replacing all bulbs with LEDs. 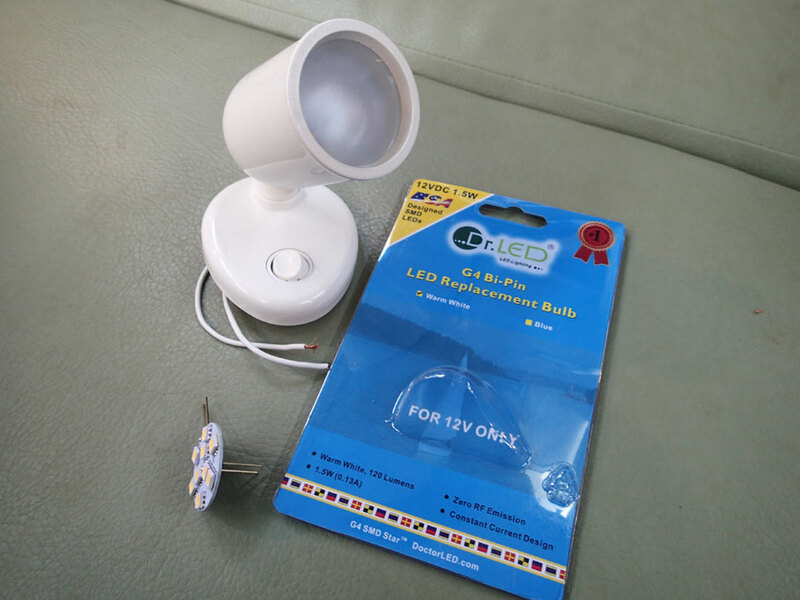 This cool G4 LED (bottom left) has pins for either bottom or side mounting. 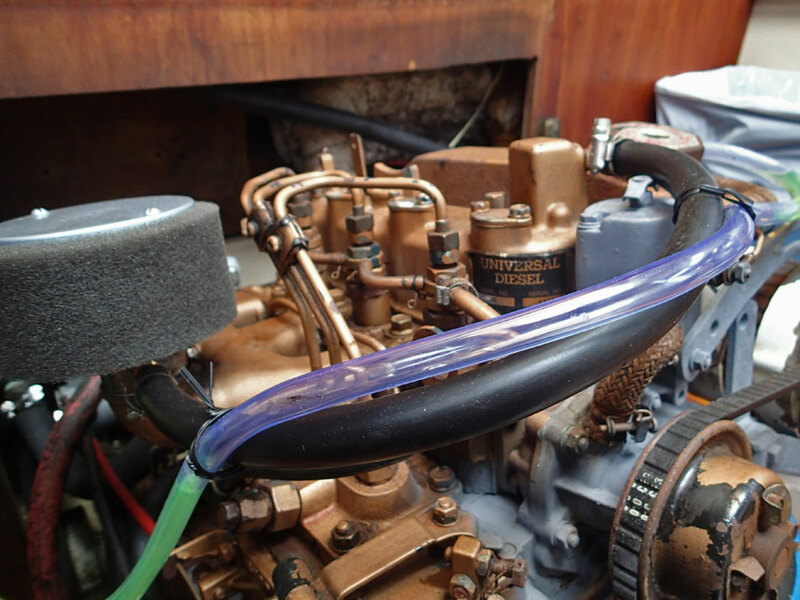 The black hose connects on the right to the engine’s oil “splash” above the cylinders. For the past 32 years any “splash” has drained down into the bilge. Yuck. I routed the hose over to the left and tapped it into the intake manifold under the air filter. 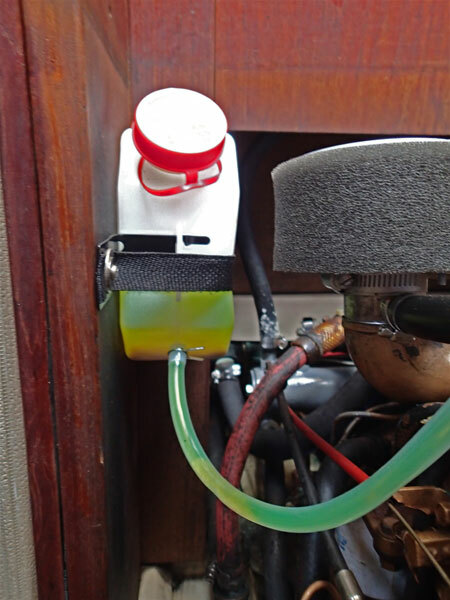 I added a coolant reserve tank to the engine. Here Duwan demonstrates that the auto-pilot works. We tested it the first season. It didn’t seem to work. Now it does. Also, one of my projects was to lower the white instrument panel in front of her enough so she could see over it. Yay. This entry was posted in Boat Projects, Florida on the Water, Life on the Water. Bookmark the permalink. Beautiful website! Glad you got all that organizing done. Are you off to Cuba? Thanks Joanne! No, not off to Cuba yet – we still have more boat projects, but come December we will see… maybe a detour on our way to Mexico. Yeah, me too, dragging through the winter project list. Hope I’ll be back in the saltwater someday. Yes, the list just seems to go on and on. I know we will see you on the water again soon! Beautiful work and done so nicely! At least if you have any problems, they will be easier to address and you know what goes where. Love the environmentally friendly oil solution. Hugs to you both! 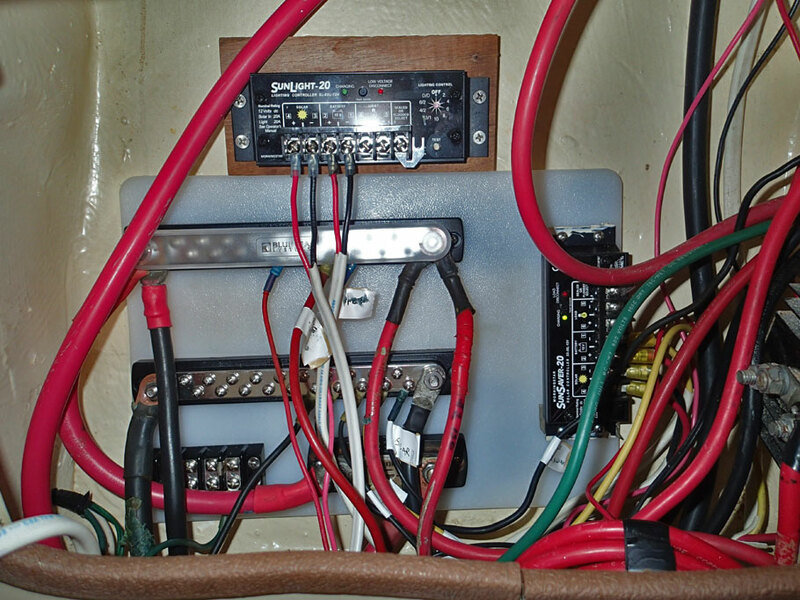 Nice work on the boat wiring. And thanks for the cleaning tips. Time to spruce up my fishing boat for the upcoming season. Glad to see ya’ll are still doing good. Yes, now that you know where all the wiring is and where it goes working on it in the future will be much easier. Pity boats don’t come with schematics! But then neither did El Segundo Chevron Refinery in California. It was constructed around 1905 (with mules!) and even today the workers don’t know where all the pipes are underground. All they know is that if you turn this valve oil/gas goes into that tank over there. If you dig a pit to lay a new pipe what you see under the sand is a maze of pipes going every which way, just like spaghetti.